New Report: Make Early Learning Top Priority in 2018 State Budget! 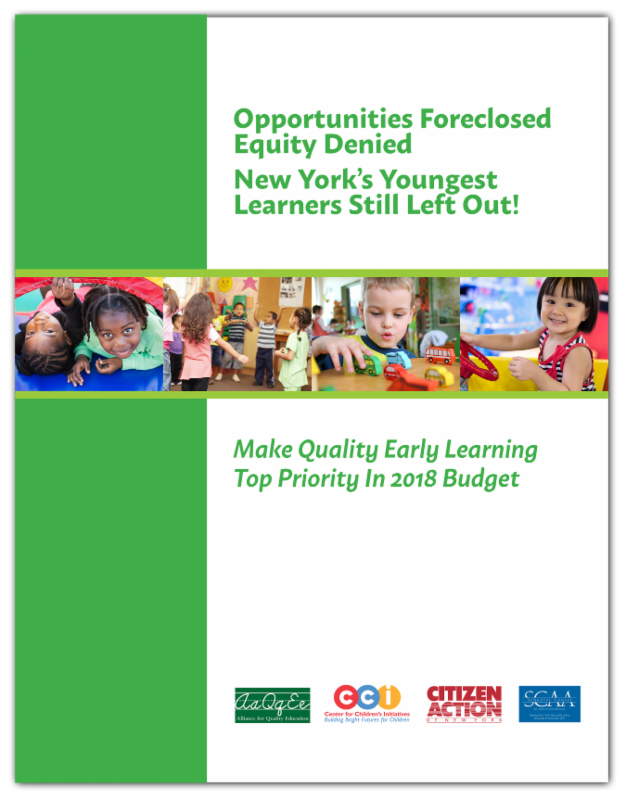 We are pleased to share our new report, Opportunities Foreclosed, Equity Denied, prepared by the Ready for Kindergarten, Ready for College Campaign, to promote expanded investments in quality early learning in the enacted state budget. · More than 81,000 4-year-olds across the state—79 percent of those expected to enroll outside New York City— still have no full-day pre-K, despite growing demand from parents and school districts. · Governor Cuomo proposes adding just $15 million for pre-K in his newly-released budget. That still leaves tens of thousands of 4-year-olds without full-day pre-K.
· A disturbing 80 percent—four out of five—families eligible for child care assistance in New York State are denied it. The state investment simply falls miserably short of the need. a top priority in the state budget. Please support and share our legislative agenda and this report widely!